Ok, so first issue has arisen. I can see that water is getting into the cabin past the windscreen seal and I found some old threads recommending using a window sealant. 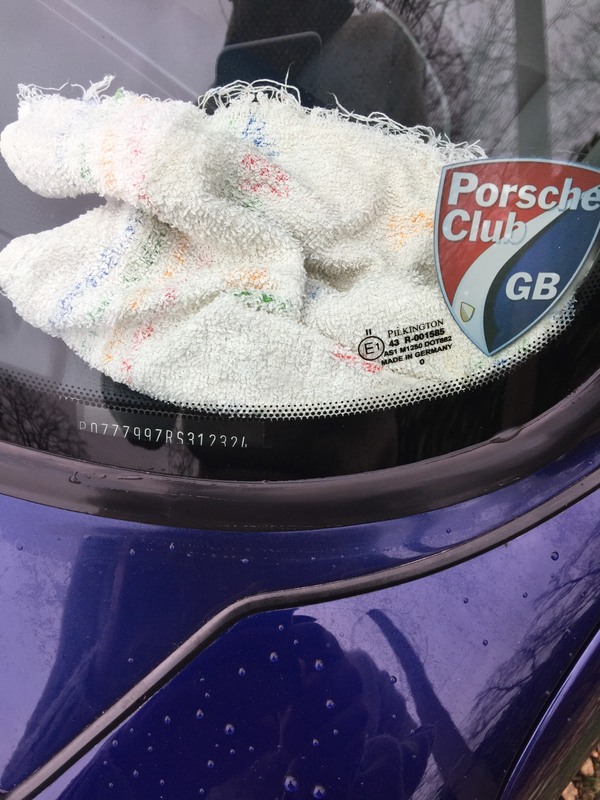 Seems a neat solution until such time the windscreen needs replacing - has anyone on here tried? Could the window seal could also be responsible for the luggage compartment also? Not sure where you are located. If anywhere near London then I would recommend Phil the Glassman. 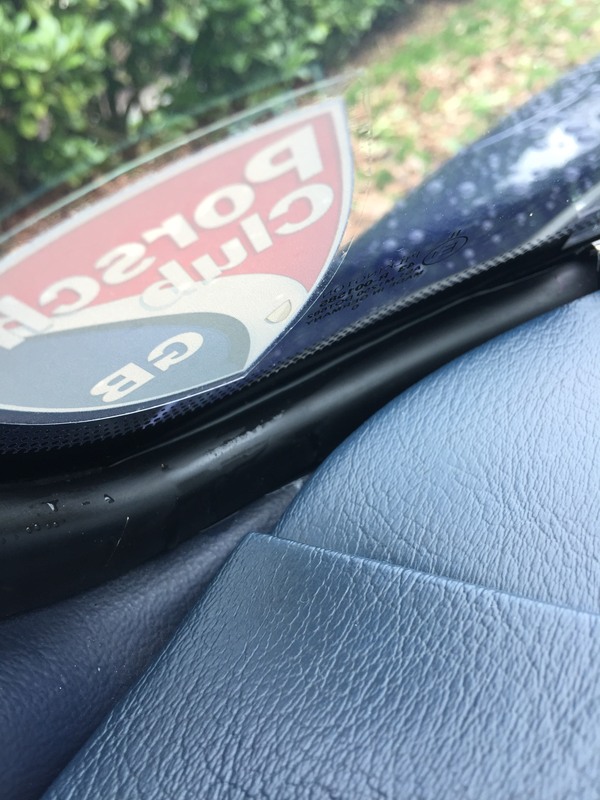 He can take the windscreen out, check what's going on behind it, treat any surface rust that's just starting and then replace the windscreen properly. He did both my front and rear screens when I bought my 993. I was a bit shocked - the front windscreen wasn't even centrally located. No wonder someone had applied loads of silicon filler. Thanks. I have some in the shed (I’ve been at this too long!). Agree it’s great stuff for keeping seals in good condition - good shout. Presumably won’t help with leaking seals though and I’ll also need sealant? Another recommendation for Glassman here. Congrats on the car, looks lovely! Thanks. I expect I will be looking for a front end respray in 3 years or so, and plan on having the glass out for that (some very early signs of rust on scuttle). I do however need the car wind and water tight between now and then! I’m in Norfolk so a bit out of the way. Second issue is the remote locking on the key fob doesn’t work. All works perfectly when turning the key in either door and batteries in both remotes seem strong. Is this a common issue by any chance? from memory yours is a pre vario 993 so probably does not have remote locking, does it have the manual immobiliser ? The alarm systems to these cars where a retrofit pre delivery by a 3rd party company for Porsche GB (Hamilton and Palmer). The spec of the alarm system changed from manual immobilsor to auto immobilsor & remote locking (I think from memory). Yep +1 with Jontt, mine is a 1995 pre VarioRam and only had central locking on the key. 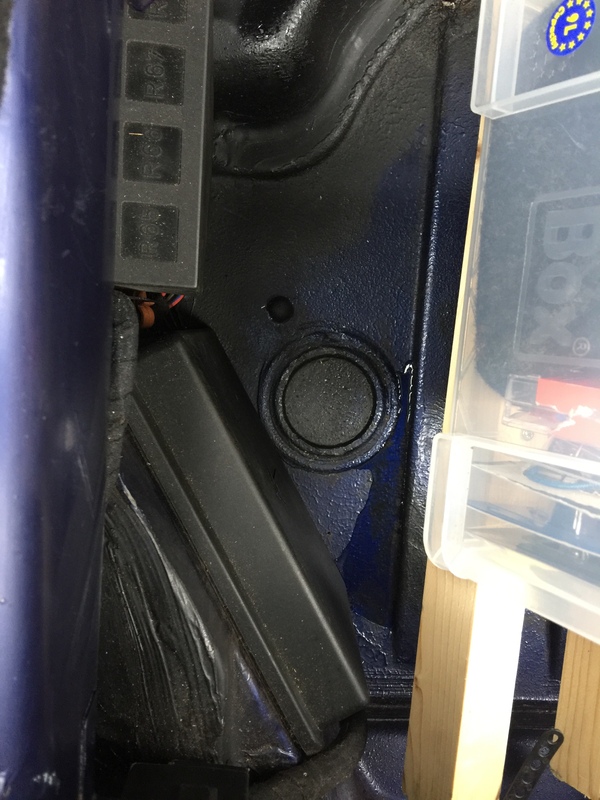 When I bought the car to the UK from Kuwait, I had a Thatcham 1 alarm fitted for insurance purposes and with that, I got remote locking with a fob. Experience told me to check the car is dry after the rain we’ve been having and discovered a small puddle in front passenger footwell and luggage compartment. I’ve been able to clear up easily with a towel and the water is clean suggesting from power hosing rather than rain, but not ideal. First of all - gummi pfledge is brilliant stuff for keeping your seals subtle (as suggested elsewhere by Jontt), so you should use this where possible. 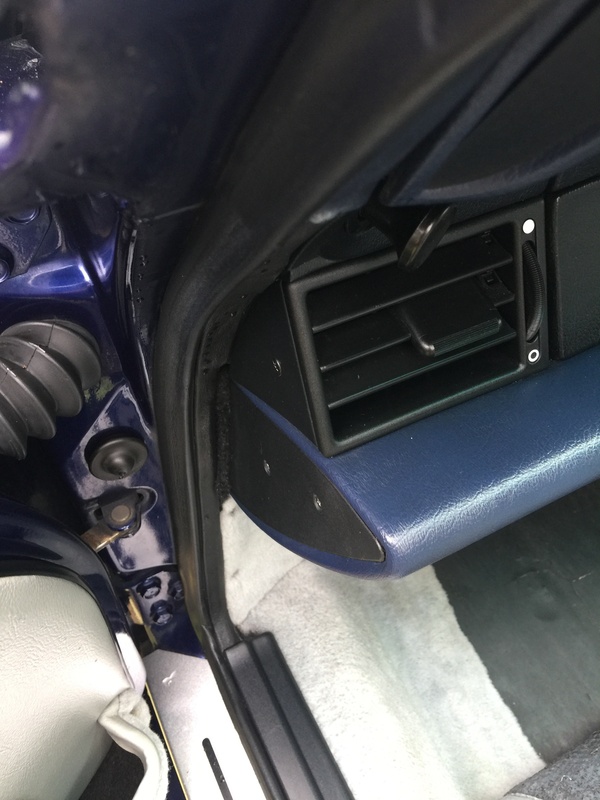 Additionally, if you do have a leak from the screen seal - that water tends to run down behind the dash onto the floor, and will then run along the channels both to the rear footwell, and to the front luggage compartment, so the can be misleading where you find the water sitting. Be aware that there are a lot of quite important electric gubbins under the seat, and you don't really want to get these too wet. Don't forget though, you can also get water in the cabin if your sunroof drains are blocked - and I would check here too. The most frustrating thing is that the sound deadening acts like a dirty great sponge and can take forever to dry out - so just because it's wet higher up for example - this doesn't mean it's the source of the leak. Thanks guys. The remote locking is a good one to take off the list. Wish I had discovered before spending a few hours investigating yesterday though! I will pick up the Tore remotes plus the HID kit. The reason I think the leak is from the windscreen is because I can actually see the water trail from the bottom corner of the windscreen over the dash and down on to the carpet. I've treated all seals with gummi pfledge (on the outside) and applied rainX whilst I am at it this morning, so will see how we fair during the downpour forecast for tomorrow afternoon! Agree I will be lucky if this solves the problem completely. Fortunately no sign of water running down the back of the dash. If it stays dry then more likely to be down to pressure washing. Ah, I thought it was your door seals, yes Gummi Pledge is less likely to solve a leaking windows seal. So an inspection of the car this morning after some rain overnight revealed more water. So unfortunately not just down to a pressure washer. Any ideas on where the water in the luggage compartment might be getting in. Seems to be just a puddle in the middle of the floor? Congrats on the purchase! The car looked very nice in the advert, with some cool visual, suspension and performance mods . Regarding the leaking issue, as you are less than a week into ownership, can you not contact the supplying garage to investigate or have it addressed? How were they able to wash and prep the car without noticing the leak themselves? Id get Paul from Glasstec round, only one way to fix it properly, anything else will be a short term fix I feel. Thanks. Yes I may well do if not an easy fix. To be fair to them they had it stored indoors and you had to go looking for the leaks. Frustrating as I had the car inspected etc. but again it's probably not the sort of thing you discover until you start living with the car. The 993 I had was an early model and came with the manual mobiliser with key for central locking. Not a fob in sight and just the chip thingy (***** of a design!). Seriously though, the frunk seal looked fine and I discounted this in the first instance. Wish I hadn’t though! Thought I owed an update, so...window leak was in the middle of the screen and seems to have been resolved with some of the glue used by the fitters but I’ll know for sure when the rain returns. The front boot is still leaking so looking at a new front seal. Might have a go at that myself. I’m getting used to the RS clutch and flywheel but something is not quite right as I get high fluctuating revs on a cold start. Cleaned the IVS valve but no improvement so I’m going to replace the O2 sensor myself next (looks straight forward) as we got an error code when I had the PPI. Probably should have done that straight away. I used to get this with the LWF when my engine was pre Vram since the conversion it doesn't happen. It would hunt for about 1 minute then settle down but kept stalling on reverse and I used to get the annoying stall at traffic lights. The O2 sensor may help looks easy but they can be welded in. Thanks. Let’s hope it’s not welded! The car has a Steve Wong chip apparently but interesting my symptons are consistent with an unchipped car. Is there an easy way to check the chip? I’ve emailed SW a couple of times for help but no respense. I haven't posted here for a while, so hello guys! Ditto what others have said about water travelling from the front to the back of the car via the ribbing in the floor. So it can in fact get in through a poorly sealed seam in the rear wheel arch and end up in the front luggage compartment. You need to check the metal floor under the front footwells for damp. There is very dense foam under the rubber top membrane and it can hold a litre of water easily I reckon. And it takes forever to dry out. If the car has had a window broken in the past there is a strong possibility that some glass will work its way down under the foam and scratch the metal floor. That plus the water will equal rust. Ask me how I know. As for the front luggage compartment the seal can let in water. You can dust it with talc and see if you can see the water trace across the seal. My brother is using my 993 as a daily at the moment. I live in HK and drive it once a year. Twice max. Im back in the UK in a few days, so am really looking forwards to driving it and getting the spanners out. I will change one of the oil tubes (for a collapsible) and top up the trans fluid (its a Tip). I think changing the o2 sensor is a great idea. The pre variorams (like mine) really benefit from a remap. I had Wayne do one for me a few years back, and the low speed tractability of the car was transformed.